Yay, you can now use Afterpay on queenb! 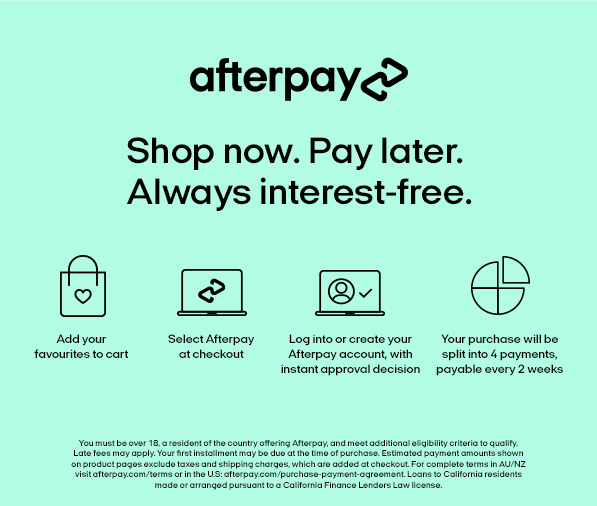 Afterpay is a "buy now, pay later" payment option. It is interest-free and allows you to buy a product and get it shipped to you straight away. Using Afterpay, you pay off your purchase in four equal, interest-free instalments, every 2 weeks, automatically, on your debit or credit card. At our checkout, after selecting "Afterpay" and clicking the place order button, you will go through to the Afterpay website, where you will need to log in, or create a quick account with them. Setting up an Afterpay account is quick and simple, it is a very fast set-up process, and only asks a few details like your email address, delivery address, phone number and credit card number. Where do I go after I have set up my Afterpay account? Once your purchase is complete on the Afterpay site, you will be returned to queenb, and will receive your order confirmation as per usual and we will ship out your order as soon as possible! Do I get charged interest using Afterpay? No. As long as you make your fortnightly repayments on time. Afterpay will automatically deduct the instalments from your debit card or credit card every 2 weeks. What is the Afterpay credit limit? You can only use Afterpay for purchases $1000.00 and under, and you are approved for the amount you spend through Afterpay (this goes through them, not us). How do I know where I am up to with my Afterpay payments? At anytime you can log into your Afterpay account (on their website, not ours) to see your payment schedule, or make a payment before the due date. What if I want to return my item ordered on Afterpay? No worries, we are happy to issue you with a credit note to spend on something else, or refund you, provided all our returns t's & c's are met. If you have any further questions about Afterpay, feel free to contact us.